American Boxing Ranked one of the 5 Best Kickboxing Gyms in America! Thai style Kickboxing is great for Cardiovascular Conditioning, Strength, Flexibility and Coordination! Ranked in the TOP 5 of Americas Kickboxing Gyms, American Boxing in Pacific Beach San Diego shares it’s ranking with gyms such as the famous A.K.A. (American Kickboxing Academy) in San Jose… not bad company! The full article can be found on Mademan.com. Kickboxing is often practiced for general fitness workout, self-defense, or as a sport. 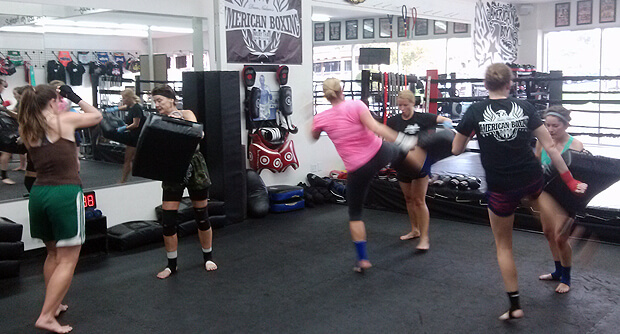 American Boxing San Diego Kickboxing Classes produce superior cardio conditioning, strength, coordination, flexibility and more. Our kickboxing training is based in Muay Thai style kickboxing and is designed to develop the conditioning of the fitness minded as well as the technique of the up-incoming fighter. Our Classes are for men and women, they last 1 hour, they are fun and they are by far the best workout around! American Boxing Kickboxing classes require NO EXPERIENCE! And, if this is your first kickboxing class EVER, be excited because American Boxing is owned by Gina Reyes and Dave Nielsen an AMAZING Kickboxing couple! You just found San Diego’s BEST Kickboxing Gym! Our Kickboxing Class Workout is always different! If you wish to proceed into advanced Kickboxing or Muay Thai training, you will incorporate sparring drills, advanced Thai Pad Work and be taught the final Thai Boxing weapons: Elbows and The Clinch! You will also learn unique Competition strategies, combinations and tactics used by your World Class American Boxing Muay Thai Kickboxing Instructors.